With my birthday fast approaching (27 days) I am starting to think about my perfect birthday outfit. I am lucky enough to have my birthday on a Friday this year, and I don't have university that day! I plan to go to a nightclub with a few of my friends to celebrate. I am super excited and have no idea what to wear. At first I was thinking a nice tunic, leggings and wedge heels but now I am thinking a dress, tights and heels. I've mainly been looking at AX Paris and New Look because they have such amazingly beautiful dresses. My biggest problem is I can never leave a 'skater dress' alone. I am always drawn towards them. Here are some of the dresses I am looking to pick from. I'm also half thinking against heels, I know it will be a messy night, I don't want to break an ankle or something. I really like the Sequin Contrast Drop Back Dress from AX Paris, it is currently £24.99 RRP: £50.00. I really like the sequin detail but I'm not sure if it is 100% me. I really like this Embellished Waist Drop Back Dress from AX Paris, it is so simple and still classy. It is currently £40. 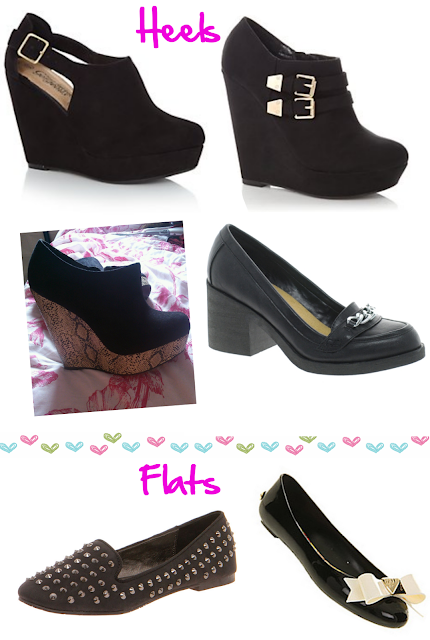 I love wedges so these Black Cut Out Wedge Shoe Boots are perfect for me. They are not too high for me. They are £19.99 from New Look. These Black Double Buckle Wedge Shoe Boots are to die for. They are a little high for me going out in but worth it. So cute! They are £24.99 from New Look. I found these Black Snakeskin Wedge Shoes on Ebay with 20 hours left for min £3.99 with P&P. I currently have a £5 voucher for Ebay and these are so cute! I love loafers and I love these Metal Trim Heeled Loafers. They are £20 from New Look via ASOS. They are a nice chunky heel so perfect for me.